This post is sponsored by Asda and made with bread that is part of Asda’s new range of artisan breads. I’m going to state the obvious and warn you. 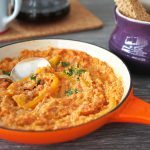 This Apple French Toast Casserole is hearty and filling, but it is so addicting that you probably won’t be able to stop yourself from overeating. My suggestion? 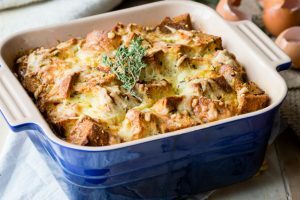 Invite friends over for brunch and make this overnight French toast casserole when you want to feed a crowd. 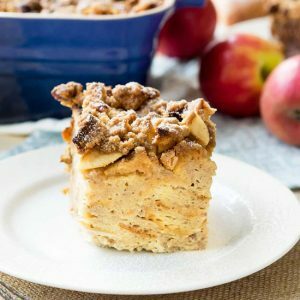 Although it looks quite involved, you’ll actually have this overnight Apple French Toast Casserole on the table before you know it. 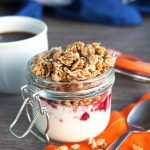 The best part is that you can prepare most of this breakfast the night before, leaving you with minimal steps to do in the morning. See that bread in the picture above? 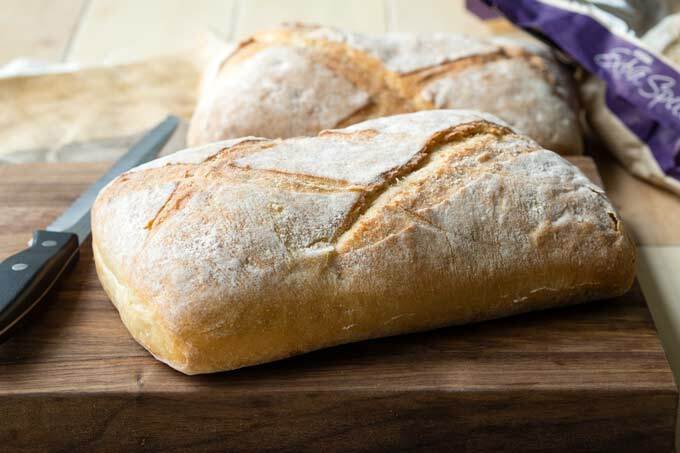 That bread is part of Asda’s new range of artisan breads, inspired by breads from all around the world. It’s The Parisian loaf, which is hand crafted by Asda bakers using traditional artisan techniques and has a wonderful depth of flavour and crust. 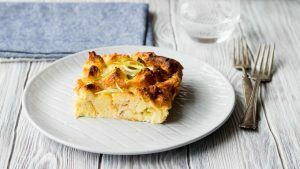 I’m sharing this overnight Apple French Toast Casserole recipe in partnership with Asda, and we’re going to show you how to turn a simple loaf of bread into a breakfast casserole that your family and friends will beg you to make over and over again. 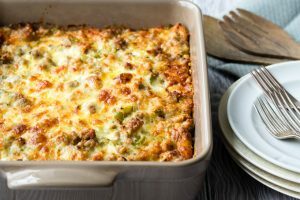 Casseroles for breakfast are a great option when feeding a big family or a crowd because you can prepare the casserole before the guests arrive, and chat with your guests as the breakfast is baking. 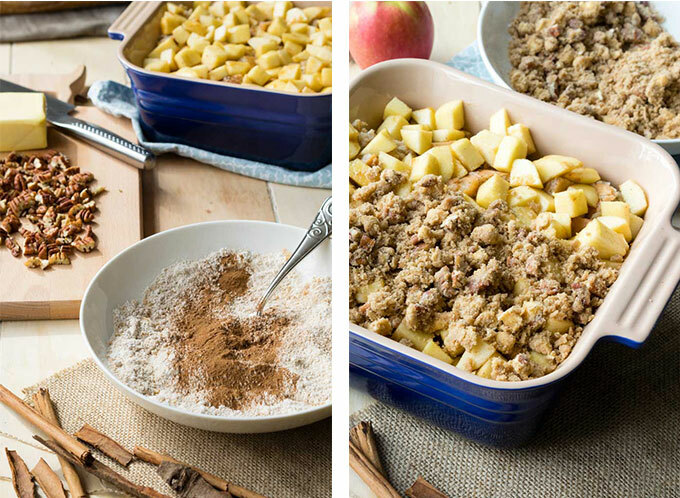 This baked Apple French Toast Casserole is particularly nice to make because it will fill your home with the sweet scent of fall as it sits in the oven. I made this delicious brunch recipe in a square casserole dish, so each slice stands as a 4-inch tall scrumptious piece of breakfast architecture. Baking it tall gives you a better picture of the layers and texture, but you can make this overnight Apple French Toast Casserole in a 9-inch x 13-inch (23-cm x 33-cm) lasagna pan. Just keep in mind the baking time will be shorter. 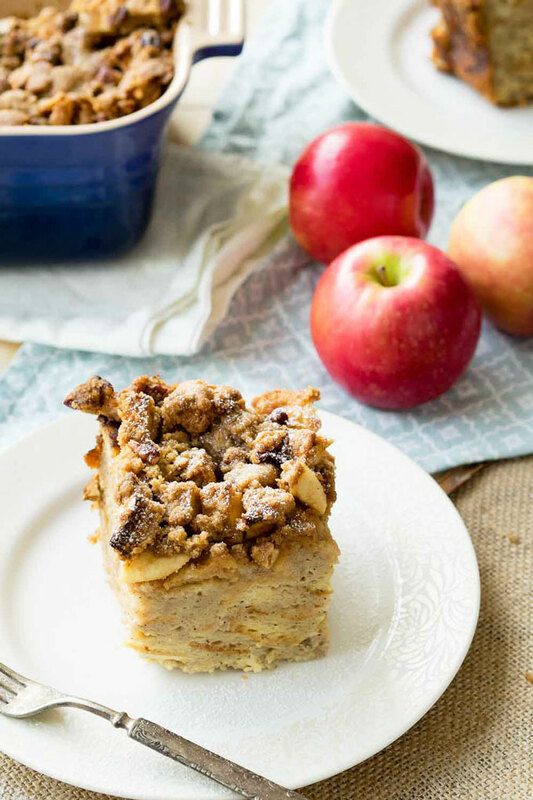 This overnight Apple French Toast Casserole is so tall because it’s made up of three layers. The bottom layer is the french toast (or bread pudding if you please). Bread cubes are soaked in a mixture of eggs, milk, and cinnamon sugar until the bread cannot absorb any more. 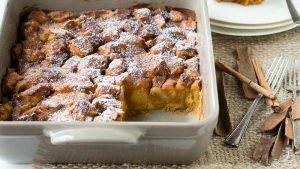 The second layer of this overnight French toast casserole is made up of apple cubes baked long enough to release an intense sweet-tart flavor when you bite into them. And finally, to top off this overnight French toast casserole is a pecan and cinnamon streusel. 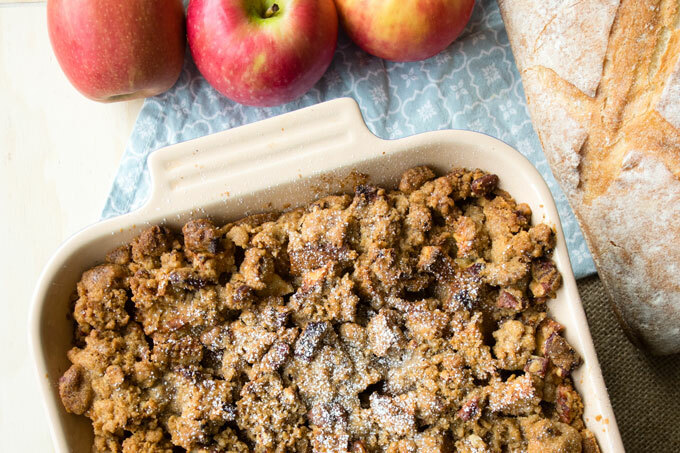 This crumb topping adds a light crunch, and gives this Apple French Toast Casserole that beautiful irresistible golden crust you wish was on everything you ate. 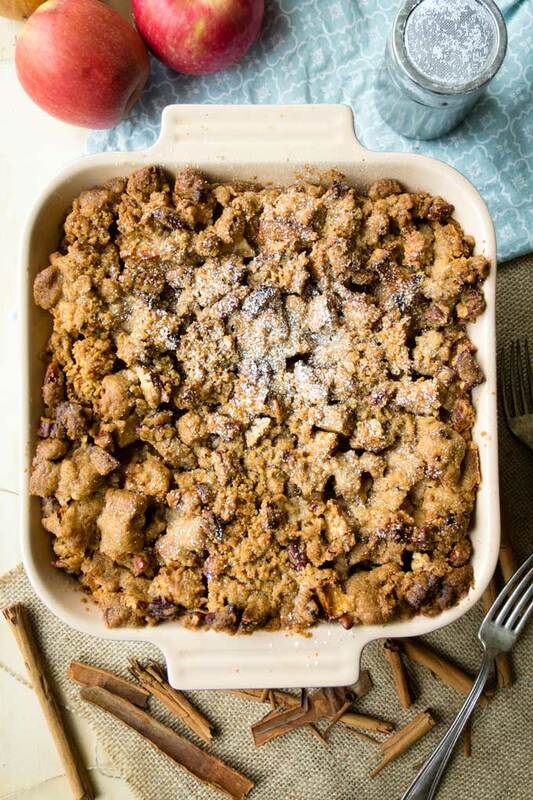 The cinnamon streusel crumb topping on this overnight french toast casserole is my favorite part! 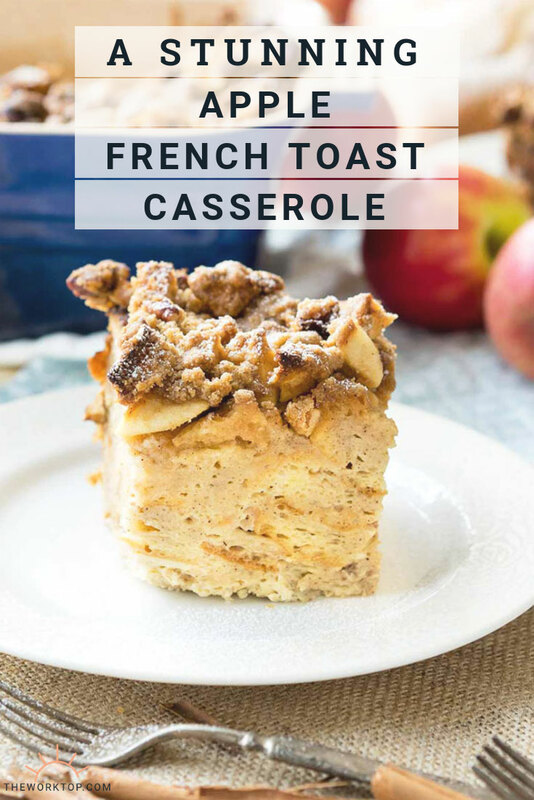 All three layers – the souffle-like french toast, the intense sweet-tart apples and the golden streusel work together, giving you a delicious and filling Apple French Toast Casserole for breakfast. As I mentioned above, I’m sharing this recipe using one of Asda’s new artisan breads. 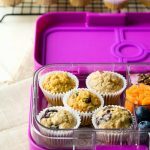 Asda’s new range was developed by Asda’s Master Baker, Maddie Munden, who travelled all around Europe visiting local bakeries to get inspiration for the loaves. 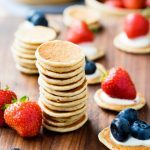 I used The Parisian for this recipe, but you can find a range of specialty breads that can be enjoyed at any meal. The range includes 13 delicious products, including Carrot & Pumpkin Boule, Sourdough Baton, Mediterranean Bread, and Jalapeno Cheese Bread. 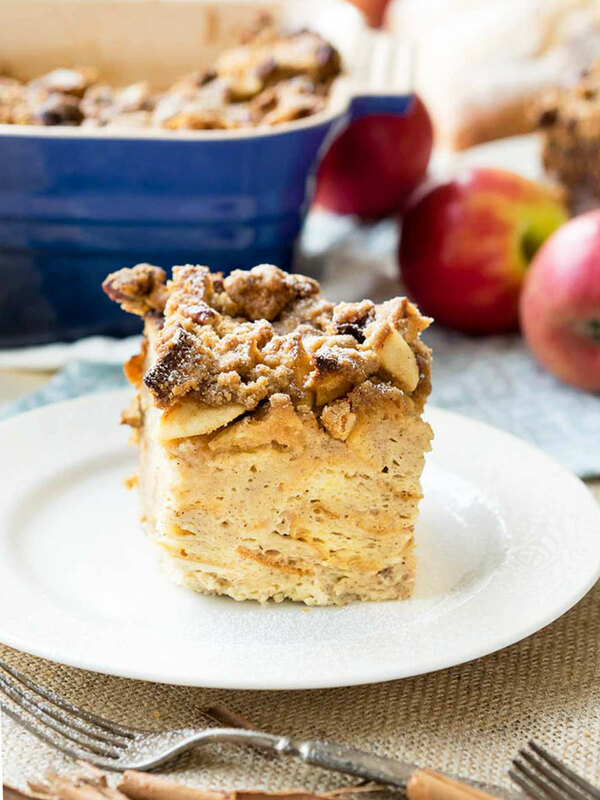 I really hope this inspires you to bring your friends and family around the table for breakfast to feast on this overnight Apple French Toast Casserole, and maybe do some catching up on the side. Preheat the oven to 350°F / 175°C. Lightly oil a 10-inch x 10-inch (25-cm x 25-cm) or a 9-inch x 13-inch (23-cm x 33-cm) baking dish. Set aside. Cut the bread into 1 1/2-inch cubes. 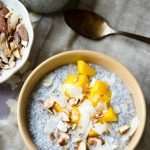 Set aside in a large mixing bowl. 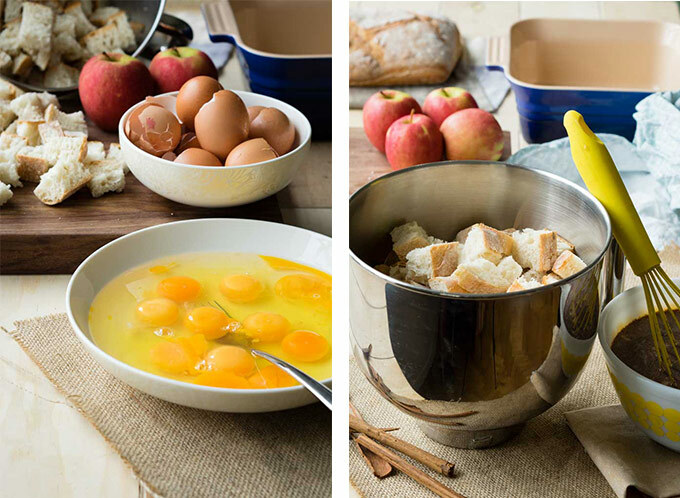 In another large mixing bowl, beat the eggs. 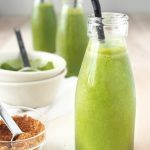 Whisk in the milk, sugar, vanilla, cinnamon, salt, nutmeg and allspice. Pour the egg mixture over the bread. Allow the mixture to sit for about 10 minutes for the bread to soak in the egg mixture. Carefully stir the bread a few times during the time to make sure all the bread pieces are absorbing in the egg mixture. 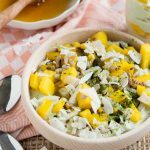 At this point, you can cover the mixing bowl and set it in the refrigerator to soak overnight. 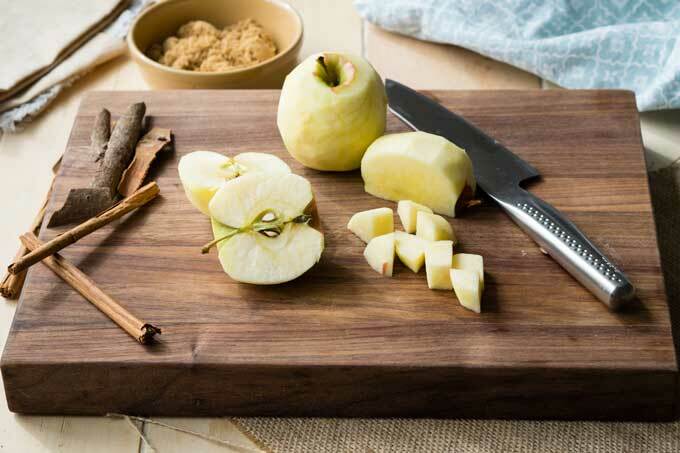 In the meantime, in a medium bowl, combine the apples and brown sugar. Set aside. If you are making the casserole the night before, you can also do this step the night before and cover and refrigerate the chopped apples. While the bread continues to soak in the mixture, prepare the crumble topping. In a medium bowl, mix together the flour, light brown sugar, cinnamon, and sea salt. 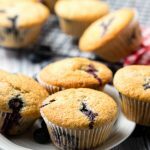 Rub in the butter pieces with your hands, or cut it in using a pastry blender, until you have a crumbly mixture that resembles wet sand at the playground. Gently mix in the pecans. Set aside. Carefully tip the soaked bread into the prepared pan. The egg mix should cover most of the bread, but it is okay if a few pieces of the bread sticks out. Evenly distribute the chopped apples on top. Evenly distribute the crumble on top. 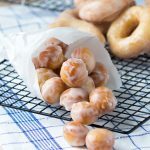 Bake in the center of the oven for about 1 hour 20 minutes if using a 10-inch x 10-inch square casserole dish, or 1 hour if using a 9-inch x 13-inch pan. The bread pudding is done when the egg mixture is set and no longer runny in the middle. Test it by sticking in a butter knife in the middle to check the texture. If the top of crumble gets too dark before the egg mixture is set, cover with a piece of foil and continue baking. Serve the Apple French Toast Casserole warm. Top with icing sugar if desired. 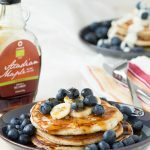 Love this Overnight French Toast Casserole? See more breakfast casserole recipes. It’s APPLE SEASON! Why aren’t we having this every day? Or at least every other day?